Info "Watch the meter and open your umbrella when it's red! Make sure your umbrella is pointing up when you do it!" Undercover Agent is one of Ashley's Microgames in WarioWare: Smooth Moves. Its name is a play on "undercover agent", which means a secret agent who is hired to get information on enemies. 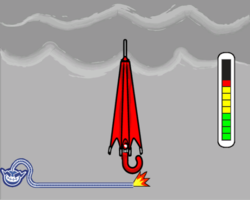 The player has to time it so that the meter on the right ends up in the red zone, then open the umbrella. The umbrella will open up to protect the person from various elements, such as rain and money. 1st level difficulty: There are four red increments in the highest point. 2nd level difficulty: There are two red increments in the highest point. 3rd level difficulty: Same as Level 2, but the player has to lift up the umbrella. This page was last edited on October 3, 2018, at 09:00.